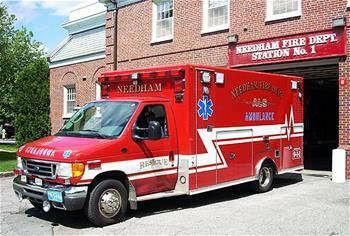 The Needham Fire Department is responsible for providing the Town with Emergency Medical Service. We do this through our cross trained Firefighting personnel. All of our apparatus are staffed with personnel trained as First Responders, Emergency Medical Technicians or Paramedics. Currently, the Needham Fire Department operates two ambulances that provide the Town with Basic or Advanced Life Support capabilities depending on the nature of the incident. This allows us to transport the sick and injured to the nearest and most appropriate medical facility available.